Making a delicious Yakisoba (焼きそば) is easy with my step-by-step guide. Learn how to make this classic Japanese street food at home. 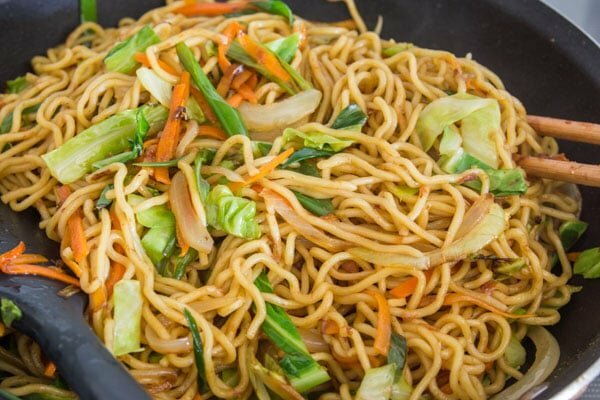 Yakisoba is perhaps one of Japan’s best known street foods and it literally means “grilled noodles”. While most people in the US know the term “soba” to refer to buckwheat noodles, soba has historically referred to any long, thin noodle. In the case of yakisoba, it’s actually made with ramen noodles. 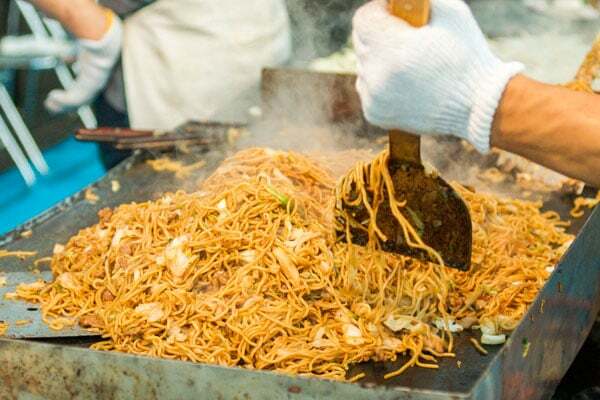 In Japan, yakisoba can be found sizzling away in stalls everywhere from baseball stadiums to traditional omatsuri (festivals). 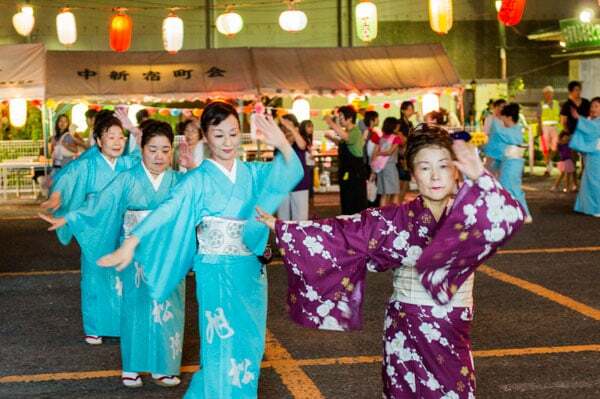 If you’ve ever been to an event in Japan, you probably remember the smell of the fruity, spicy sauce caramelizing on giant teppans (cast iron griddles) with the noodles. The signature sweet and tart flavor comes courtesy of chuno sauce, known simply as sōsu (sō as in soda, and su as in suzy) in Japan. It’s a condiment poured on everything from tonkatsu to salads and is used in dishes ranging from hamburg steak to to Japanese curry. Made with ingredients such as tomatoes, prunes, apples, carrots, onions, garlic and ginger and seasoned with spices such as cinnamon and cloves, chuno sauce is sweet, tangy, savory and spicy. I guess the best comparison (and indeed a suitable substitute) is a mixture of worcestershire sauce and ketchup. While most street food versions of yakisoba are mostly noodles with a few scraps of cabbage here and there, I like loading my yakisoba up with veggies (and sometimes seafood or meat), turning it into a complete meal. I didn’t add any meat this time, but if you do decide to add some, cook it first, before the carrots and onions and then transfer it to a bowl, adding it back in at the very end. 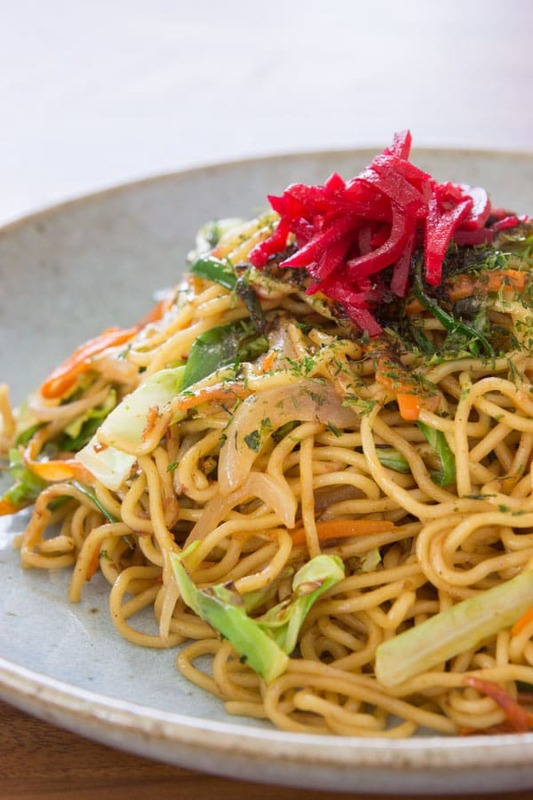 The classic toppings for yakisoba are aonori(green nori flakes) and benishōuga (red pickled ginger), but some people like topping theirs with spicy mustard or even mayonnaise. Boil the noodles for 1 minute less than what the package directions say. When the noodles are done, drain and rinse very well with cold water, using your fingers to agitate the noodles. Drain as much water off the noodles as possible by using a dropping motion with both hands and yanking up suddenly. 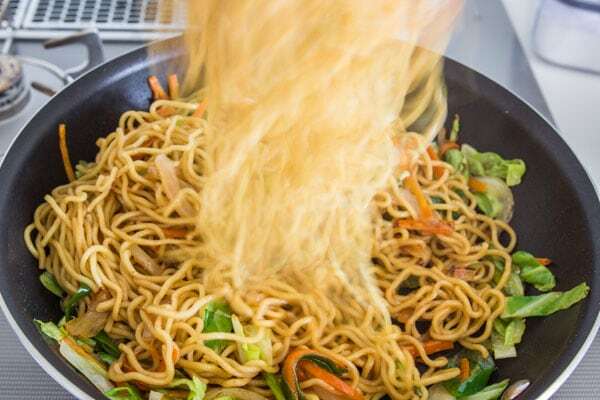 Toss the noodles with 2 teaspoons of vegetable oil to keep the noodles from sticking together. Prep the vegetables and make the sauce by whisking together the chuno sauce, oyster sauce, and white pepper. Heat a pan over medium-high heat until hot and then add 2 tablespoons of oil along with the carrots, onions and any tougher bits of cabbage. Stir-fry until the carrots are tender and then add the cabbage and scallions. 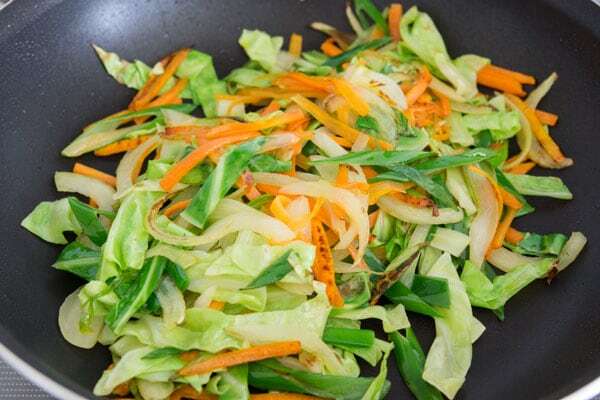 Continue stir-frying until the cabbage is cooked. 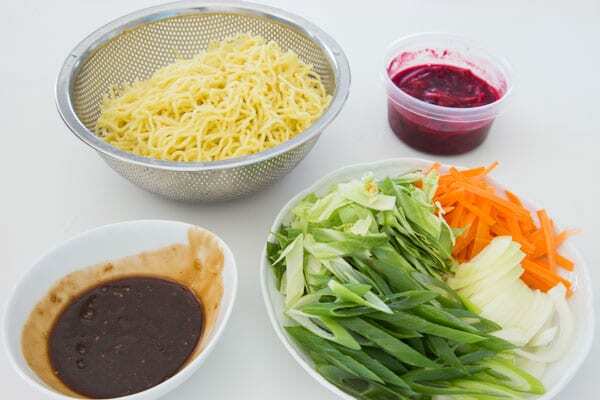 Add the noodles and sauce and use two utensils to lift and drop the noodles as if you're tossing a salad to coat them evenly with sauce. Sprinkle the katsuobushi onto the noodles, and continue tossing until the noodles are a uniform color and you can smell the sauce starting to caramelize. Plate the yakisoba and sprinkle with aonori and beni shoga to garnish. Hi Marc, great post. If you were to guess, what do you think the ratios of Worcestershire and ketchup would be to make the alternative sauce? Would you still use oyster sauce? Hi Ali, good question. Try a 50/50 mix, it should look like what’s in the bottom left of this photo ( http://cdn.norecipes.com/wp-content/blogs.dir/1/files/2013/07/yakisoba-1.jpg). Dark, and thick. In terms of taste, it’s sweet, sour, and spicy (as in spices not chili peppers). Yep, you’d still want to follow the recipe as is (including the oyster sauce). I got 404’d by your link. D’oh! Awesome- I’ll keep an eye out for it! Hope you are doing well! I always use the Bull-Dog brand’s Worcestershire Sauce – which is the way my mom showed me. How much of a difference in taste is there between their W. Sauce & the Fruit & Vegetable Sauce? I will have to pick up a bottle of this sauce, & do a comparison taste test w/mom & hubby! Hi KKasper206, the chunou sauce is sweeter and more viscous, so it caramelizes better on the outside of the noodles rather than soaking into the noodles. Give it a try and see what you think. Have you considered Pickapeppa sauce? I subbed it for the Chuno and was very happy with the outcome. Also, it’s cheaper and you can get it in any grocery store. Made this for dinner last night. I added some thin sliced pork which I stir fried first, and also added some sugar snap peas wih the vegetables. Left out the katsuobushi, since I addad meat. Increased the sauce a bit, as we like it saucy. This dish was DA BOMB! Fast, easy and really yummy. Thanks, Marc, for making my introduction to Japanese cooking so easy and tasty. Can’t wait to try more things! Great idea adding the pork! Glad to hear you enjoyed it! how long does it take to make this? It depends on how fast you work, but I’d say 10-15 minutes. Hot night for the SF bay area. Don’t wanna cook. Draggin’ my knuckles on the ground, it’s 95+. Dinner…what to do? I thought what’s that noodle dish, yakisoba — that sauce is great. Raided the vege drawer, boiled up those noodles, tossed it all up w/the sauce. ~20 minutes what w/my slow prep time & “he’s” fed. He says, good stuff. You know, I put katsuobushi on there as in the recipe, and my Japanese wife thought that was weird. I liked it, tho. Like okonomiyaki, etc. Anyway, thanks for the recipe. I put green pepper on there as well. Hi Sircnawsnaws, it’s not as traditional of an ingredient to add as aonori, but you can reassure your wife that this recipe was made by a Japanese guy living in Japan and adding katsuobushi is not weird. Yeah, seems normal to me. Must be just the way her family eats it.